While still an undergraduate at Cambridge University, he fell twice, for no apparent reason. At 22, an unpromising, half-hearted doctoral student, he was diagnosed with ALS and given two years to live. Something happened then to Stephen Hawking. He woke up, as from a half-lived life. He married and fathered three children, got serious about black holes and discovered some pretty major things about them (that they can leak energy and gradually fade away into nothing – that was a Einstein kind of breakthough), proposed a model of the universe which has no boundaries in space and time, and wrote A Brief History of Time, selling over 10 million copies worldwide. Along the way, he married a second time, dominated his field of scientific research for four decades, appeared as a bit of a celeb on The Simpsons, Star Trek, and a Pink Floyd album, and lived to see, this week, his 70th birthday celebrated by a gathering of world-class, adulatory scientists. The disease, over its 48 year course, has taken his legs, arms, trunk; his chance of swallowing, even breathing normally. He is force fed. He can no longer speak. Three caregivers work in shifts to attend to his basic needs. And yet, his mind, surging beyond that withering flesh, travels in orbits more spacious than most of us can imagine. At a gathering in December, he was asked what he is working on now. Long pause. Fiddling with his computer equipment, he finally eked out the six words allotted each minute by his robotic voice generator. The origins of the universe. At the same time, he worries about the path of destruction we’ve charted on the earth and pleads with politicians to colonize other planets. 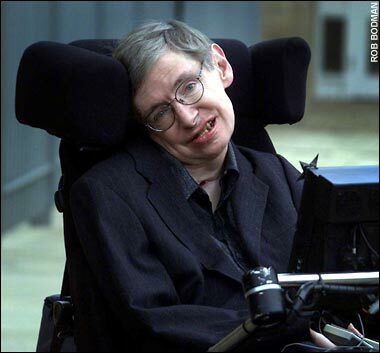 With so vast a reach of mind, Stephen Hawking lives in a super-sized vision of reality, once calling planet earth, endearingly, our mote of dust suspended in a sunbeam. Over Christmas, I gave my father another tour of his ipad2. He was bent on finding a particular New York Times editorial that scratched his mind, that fed a thought he’d been thinking. He announced in garbled tongue that his latest book was coming out in March, and that he is halfway through the next one. My mother worries when she finds him hunched over his wheelchair tray, pressing the weight of his body into a slowly scrawling pen for hours. But I see a mind surging, expanding into a larger and larger reality, even as his body leaks energy, like a black hole, slowly fading into nothing. I see his thoughts ablaze in another realm where the body drops away. I see his energies gather and rise, like a mote of dust suspended in a sunbeam. ~ by Susan on 01/11/2012.